First Lines: Few travellers braved the treacherous mountain passes to reach the forest of Tannock Noor and that was the very reason one man had gone there to live. When Marcel defeated the great dragon of war, Mortregis, he thought he′d destroyed the Book of Lies as well. But one fragment remains, and this is what his brother Fergus has taken with him on a journey that is part quest for revenge, part search for his own place in the world. In this much anticipated sequel to The Book of Lies, Fergus hunts down the ruthless Damon, armed with a weapon that will let him challenge the man in mortal combat. One of them will not live to see the story′s end. As Marcel and Nicola pursue Fergus, each with their own cares, Nicola will discover the value of the very thing she has been fleeing and risk losing it forever. 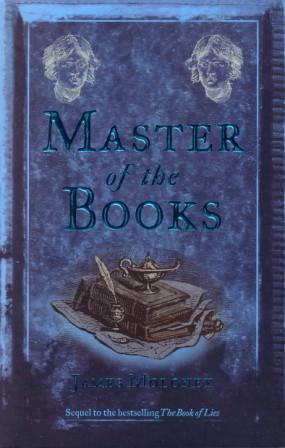 As for Marcel, the new Master of the Books, is he truly a great sorceror or nothing but a charlatan? Only when the fate of the entire land lies in his hands will he know what his destiny is, and only then may the last fragment of the Book of Lies be destroyed. Master of the Books is the second book in the Book of Lies Trilogy. It's aimed at ages 10+ and I have to admit it's a brilliant read. Fergus has taken off to kill Damon. King Pelham begins to bring potential husbands for his daughter Nicola who is not ready to marry. And Marcel, struggling to control what small amount of magic he has been able to muster without destroying something. Yet again, another entertaining book by James Moloney. There were a few slow spots, and the plot was a little predictable but fantastic book otherwise. Marcel, Nicola and Fergus do a fair bit of growing up with every challenge they face and I'm definitely looking forward to the last book Books of the Baden Dark to see where the journey for these three are heading. Great story filled with magic, action and bravery, a well written story that everyone of all ages can enjoy. I haven't read this series. Looks good. Thanks for the great review. Another to add to the TBR! I haven't read this book but the cover draws me towards it. It sounds great. I must add it to my tbr.